The Donors’ Assistance Group in Ethiopia (the country heads of 26 aid agencies working in Ethiopia) had an awayday yesterday, and I was invited to speak to them about the future of aid effectiveness. The Deputy Finance Minister addressed the donor heads before me. In a very dignified way, he delivered the blunt message that the donors are not living up to their commitments in the Paris Declaration on Aid Effectiveness. That was the perfect platform for my presentation which argued that aid effectiveness matters, that there are good reasons why the Paris Declaration is not going to bring about more effective aid, and that the donors in Ethiopia should work differently to improve aid effectiveness. You can view and listen to my presentation by clicking the image below. This narrated presentation lasts 20 minutes (beware: when you click you’ll start to hear my voice, so don’t do this if you are in a meeting!). Alternatively you can download the presentation as a pdf here. The donors seemed to find the ideas in the presentation interesting. There was little dispute with the analysis that it is very hard to make progress on the Paris agenda as it is currently conceived, though some scepticism that it would be possible, in practice, to change the incentives enough to change behaviour. There was also some instinct to blame the Ethiopian government for things that don’t work very well. I didn’t really get the sense that they had taken to heart just how bad things are at the moment. Please let me know in the comments what you think. Is Paris going to work? Owen replies: Thanks Kate – and best regards to you and Kalayu. Yes, you are exactly right: the farmer does indeed make his or her decision about what to grow in the light of information about the opportunity costs of his or her competitors, summed up and expressed by the market by way of the price signal. Cash on Delivery is different from budget support in a number of ways. One is that it is binding and so more predictable: if the results are delivered, then donors have to pay. This enables developing countries to invest their money with confidence. Another is that it is smoothly continuous: there are not targets and triggers: more results means more money. Another is that it is more transparent and accountable, because there is a common, easily understood amount of money available, and so citizens can hold their government to account for delivering. Another is that it is more explicitly focused on outcomes, forcing governments and donors to collect information about outcomes that matter, rather than wasting so much effort monitoring inputs and processes. Another is that it makes it much simpler for citizens of donor countries to be confident about what results they are paying for. Thanks for the positive feedback: much appreciated. I like the slides. I am a political scientist, and recently re-read part of Stephen Walt’s “The Origins of Alliances”. He presents an interesting hypothesis regarding aid that I think is important to consider amid the talk of decreasing project/donor proliferation and fragmentation: “The greater the donor’s monopoly on the commodity provided, the greater its leverage over the recipient.” (p. 46). Although it seems that the current donor/project proliferation is out of hand, it might be worth thinking about the optimal amount of diversification in provision of aid (from a recipient perspective) – certainly less diversification is not always better. One might think of a recipient wanting to balance simplicity (a good thing) and insurance against risks associated with relying too much on a particular donor (also a good thing). I do not mean to suggest that the slides imply we should go too far in the streamlining direction, I simply think the general case for some diversification doesn’t tend to be made on the aid blogs which are – understandably – concerned with the somewhat ridiculous amount of project proliferation currently observed. There appears to be general agreement that less fragmentation than the status quo would be a good thing. However, as the development community thinks about streamlining the process, it is important to think about the political repercussions for recipients surrounding the way in which de-diversification is handled. Owen replies: Sarah – thanks. I agree with this. This came up a little in the discussion yesterday. One of the agency heads made the point that some diversity is desirable. I agreed – in particular, there is a strong case for there to be specialist agencies working on small, self-contained projects in their areas of expertise (e.g. WHO working on pharmaceutical regulation). I said that don’t have a strong prior on what the right amount of fragmentation should be. But what is clear is that there is nothing in the current system to push it towards the optimal balance between the costs of fragmentation and proliferation and the benefits of diversity and specialization. There is nothing in the system that pushes donors out of sectors in which they are inefficient, or which pushes them to specialize in areas where they have a comparative advantage. An interesting post/presentation, thanks. I agree with a lot of your analysis, but not entirely with your solution. A recognition of donor incentives is long overdue and surprisingly rare in these discussions, and is the best point of your analysis. Unfortunately, I don’t see how donors do have the incentives to enact all your solutions. For example, you want donors to publish information regarding their unit costs, so that the public can respond to this information, which will ultimately change donor behaviour. However, we know the USA stopped publishing data on how much of its aid is tied, precisely because it wanted to avoid this scrutiny. It has also been common knowledge that donors commit silly errors and proliferate too widely. But public knowledge of this has not created incentives for it to stop. Perhaps you have a much greater belief in the responsiveness of governments or the commitment and awareness of electorates. However, after the make poverty history campaign we have seen many governments renege on commitments with relative impunity. So, is my argument that nothing can be done? No. The one point that I think you underemphasised in your analysis was that fragmentation is a result of distinct preferences. The obvious next step is to recognise situations where preferences overlap. (Self-promotion alert.) A recent paper of mine looked at aid allocation and found distinct donor preferences, but also identified the Nordic+ grouping as having overlapping preferences. The implication (and it is just that) would be that future efforts for harmonisation would be more valuable if they were focused on this grouping. For example, in your presentation you stated that multilateral aid was ‘wired’. Multilateral aid has been the prescribed solution to fragmentation for a very long time, and donors don’t do it because their preferences are distinct. However, the grouping of like minded donors could agree to divide up sectors or countries, while employing each others’ staff and funding each others’ projects. Owen replies: Thanks Paul. You ask a good question (which was also raised yesterday): if donors don’t have an incentive to do the right thing, why would they be able to make changes that will put them under pressure to do the right thing? There are several answers to this. One is time-inconsistency. Your question is a bit like asking: why would any government make its central bank independent? Governments do so because they are able to take a long view of their interests, and put in place mechanisms that tie their hands in the short term. The second reason is that the aid system does not have a uniform set of interests, and it is possible to take advantage of that. For example, many people who work in development agencies WANT aid to be more efficient, and are frustrated at the political pressures that make it hard for them to make the necessary changes. While donor agency staff cannot and should not bypass the wishes of the public by, say, making long term predictable aid commitments, donor agency staff can make changes such as greater transparency, which the public also supports; and my argument is that this will, in the long run, lead to changes in political opinion. I do not think that stronger political pressure is a complete panacea; but I think it will help to move us in the right direction. I think that change that does not address the incentives will not be sustainable: we have to change the equilibrium, not move away from it. My worry about ideas of taking advantage of overlapping preferences, such as employing each others’ staff, silent partnerships, etc, is that this seems to me to be adding a layer of complexity over the existing system in an attempt to mask, rather than address, a real tension. It may help a little in the short term, but I fear it will be applicable in a relatively small number of cases, it will prove hugely difficult and complex in practice, and if it ever becomes large enough to be important, it will fall apart because it hasn’t addressed the underlying problem. As usual, a very thoughtful post that leaves me wanting more. You could probably write a book to illucidate your Expired, Tired, Wired table. Two comments: The problem with your analogy with markets is that the aid business has no single metric of effectiveness the way market competitors do. Profitability is a universal metric that works in any country for any industry. Highly profitable companies attract more capital. How do you compare the cost per kilometer of road achieved by one organization with the cost of educating a child or the cost per person on ART or the cost per bad policy reformed? Comparing within each sector using common metrics would already be a step in the right direction, but to get to the goal of comparative advantage, some sort of metric for comparing apples and oranges has to be established. 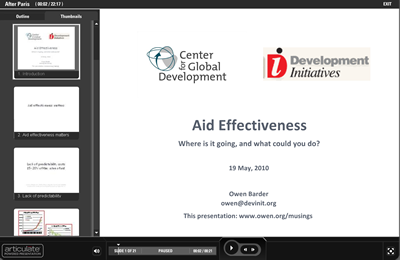 The second part of the problem is getting more donors to care about aid effectiveness. Unlike profitable companies, highly effective aid organizations do not necessarily attract more support. Indeed, for some donors effectiveness is not about low cost per output, it is about spending the most money in the allotted time. You have to believe in cost efficiency to pursue it aggressively in development– too often it goes unrewarded. Finally, it is not obvious to me than more small projects is necessarily bad. It may be, but it depends on who is running the projects, how they are run, etc. It seems to me that the largest, best funded projects create the biggest drain on government resources, and run the greatest risk of altering the landscape of a country– both for the better and worse. Very good presentation, and right on the money, though I feel a little pessimistic that things will change – though that shouldn’t stop people trying. Overall, your analysis is spot on that a proliferation of small projects is not very sensible and clearly it undermines ownership. 1. I worked for DFID and was once asked, by my boss, to make sure we spent an extra £1million in the last month of the financial year – which I’m afraid to say we did, on an IT project that really didn’t benefit poor people at all. 2. I am now a trustee of a tiny charity (I don’t earn a living in development any more) that works on education in Tanzania. Every single pound we raise goes to support education in a poor district in western Tanzania. We don’t spend money on campaigning. We don’t spend money on administration. If I had £1000 to reduce poverty, would I give it to DFID or to the charity I am a trustee of? I think the latter – it would have more of an impact on people’s lives. This does not mean I would support giving lots of aid to big NGOs – Oxfam, Save the Children etc. Though they do good work, far, far, far too much money goes on UK costs (staff, campaigns, admin etc). Excellent presentation. In earlier posts, it seemed to me you were positive on the Paris agenda, I am glad to be corrected. Aside form the mind shift that is necessary with the policy makers to make aid really more effective, a lot must be done to “level the field”. Point one and two are indeed closely linked: it is about organizing aid in a way that results are easier to judge, and making sure they are judged. Going for standard forms for project documentation is the foundation for making evaluations comparable. However, the people now driving the aid agenda have no mindset for this type of work: we have the wrong people in the room and they don’t want to go home. What about the politics? Isn’t part of the reason why aid is not as effective as it might be to do with the failure of donors to understand and engage effectively (and with due care) with the politics of the places into which aid is pumped? I wonder whether the donors’ reflection included consideration of the relationship between politics and aid effectiveness (and even the influence of aid on supposedly domestic politics), and the need for donors to better understand the politics. Or perhaps the political landscape for donors in Ethiopia is considered so problematic that this sort of discussion is best avoided? Owen replies: I think you are blaming the victim, Alan. The most egregious examples of ineffective aid in Ethiopia – such as the proliferation of donors and projects – have nothing to do with Ethiopian politics and everything to do with donor politics. That doesn’t mean that Ethiopian politics does not matter for whether or not they make progress on development: of course it does. But Ethiopian politics does not explain why donors behave as they do. I’m afraid you are a man with a hammer, and everything is looking remarkably similar to a nail …. I’d best not get into a discussion of what are the worst examples of ineffective aid in Ethiopia. However,my point was not that Ethiopian politics explains how donors behave, but that to make their aid more effective donors need to have a better understanding of the landscape of politics and governance in the countries to which they provide aid. Not a stunning insight, but one that many discussions of aid effectiveness still neglect. But DfID has already suspended part of its Development Education budget, and cut £500,000 (small fry I know, but still a signal of intent) in its drive for “value for money”. DfID seems to value the opportunity cost of educating UK citizens on development aid, which will increase the accountability that you say is essential for it to improve its effectiveness, as lower than its overseas budget. It seems like a false start and a move in the wrong direction. A note aside, for your next post on having a computer in the field, do mention something on how to best access the ongoing debates in international development(through presentations such as your own) if you happen to live in an area that Amazon doesn’t deliver to. Owen replies: Thanks Max. I like your blog. I’m not as hostile to “rent seeking” NGOs as you imply (some of my best friends, etc). But I am worried that our system does not include mechanisms that squeeze out rent seeking (or inefficiency, corruption, ineffectiveness etc) where it exists. Many NGOs are terrific, many not: but there is nothing that tends to sustain the good ones and kill off the bad ones. Fascinating presentation, most particularly the Exprired, Tired, Wired table. But I agree with some of the earlier commenters that you are being optimistic about the willingness of donors to act against their own existing incentives in order to encourage the development of incentives that would produce a better system. I take your point about short- vs long-term considerations, but I think the majority of donors would be petrified by the risk that subjecting themselves to greater scrutiny would simply result in aid budgets being reduced. This is particularly an issue in the current economic climate. Rather than try to change incentives by harnessing domestic (donor country) political pressures, I think a more effective route would be to introduce market pressures into donor coordination. You touch on this with your comments on unit costs and Output Based Aid / Cash on Delivery. As another commenter noted, this requires some diversity of projects, but if it helps incentivise better division of labour then the net result would probably be less projects compared to the current trajectory. It would also be supported by the shift to multilateral aid since that introduces buyers (bilateral donors) who can choose from among several providers (multilateral agencies) according to who is producing the best results at the cheapest cost. This would also help increase the discretionary space for recipient governments (through the cash that flows in following delivery), an important precondition for social accountability. Very helpful presentation. I have only one point with reference to your table. I think it’s incredibly naive to put multilateral aid in the ‘wired’ column. It’s simply displacing the accountability to boards of such agencies, viz. the WB and the multiplicity of multi-donor trust funds and the like. Many of the so-called ‘like-minded donors’ have shoved increasing amounts into multilateral aid as ways of upping their spending when they’ve been deprofessionalising and reducing their own staff. The transparency of such multilateral aid and more importantly, the accountability of such aid to its contributors – no less its recipients, which, of course, is your main point, would have to be light years away from current practice. Many of the hard decisions that bilaterals don’t want to take, they shove to multilaterals, viz. all the fiduciary risk assessments by the WB, thus reducing so often, the risk taking that would enable them to be responsive to the ultimate recipients. Yes, this could change…..but currently ‘wiring’ multilateral aid looks suspect to me. Pingback: What can development policy learn from evolution?